Yes, We Are All PKK! pennine: The Kurds have my praise & admiration, out of all the forces Really fighting Isis &its allied terrorists(aka “moderates”) the Kurds, Syrians,Russians have been the 100% trustworthy at actually doing so. It’s very difficult (nay impossible at times) knowing which side Turkey is on, & the same could be said also of others in the NATO group.But the good Kurdish fighting force have been dependable throughout. It’s by now very clear that Turkey has done and will continue do everything in its power to demonize the PKK and blame it for every bad thing affecting Turkey, especially the violence that’s mushroomed there. The PKK is a political party that emerged in 1979 but decided to take arms in 1984 only when Turkish fascistic violence was multiplying against defenseless Kurdish people and when Turkish racism was hurrying to eradicate Kurdish identity. Turkey, then, having the privileges to get all the support it wanted and which it asked for from NATO, was literally laughing at the PKK demands for a democratic solution of the Kurdish question. Now, people with political knowledge around the world know that the violence in Turkey did not start with the PKK’s decision to take up arms in 1984. Turkey has been practicing fascistic violence since the very first day of its establishment back in 1923. The extermination war, including prohibiting languages, cultures, music, national dresses etc., against Armenians, Assyrians, Kurdish people and others started with the aim of Turkifying everyone who happened to be a part of new Turkey. Between October 29th 1923, the establishment of the Turkish state, and 1984, the PKK’s decision to take up arms, the state of Turkey committed atrocities against non-Turkic and non-Sunni entities even outside of Turkish territory. The European democracies’ decision to declare the PKK as a terrorist organization was a political decision: it was a helping hand to “allied” Turkey. The decision however had and still has devastating consequences for Kurdish people as Turkey wanted to get as much as military, logistic, diplomatic and political support as it could in order to accomplish its goal of finishing the Kurds. The aim of Turkey, as it’s clear now, was not in fighting the PKK only, but rather in declaring everything as PKK in order to legitimate its fascistic aggression towards the Kurdish people. Since then, the history of Turkish legislation has been that of legalizing state violence against Kurdish people. The Turkish armed forces and so-called “police” force can precisely do whatever they wish against Kurdish people. Turkey is doing everything to not solve its own Kurdish issue. 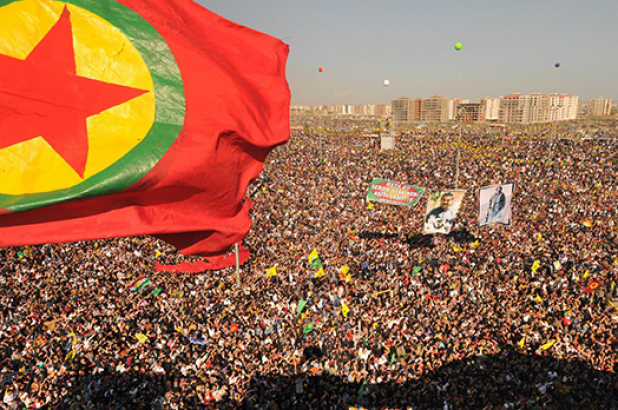 Therefore Turkey sees every Kurdish advance around Turkey as an “aspiration” for Kurds in Turkey to demand their national and democratic rights. Turkey therefore labels every Kurdish struggle for a peaceful democratic solution, even outside its territories, as “PKK” in order to legitimate its aggression against the Kurdish national movement. Inside Turkey, every single Kurdish political party has been labeled as “PKK Supporters”/ “PKK Sympathizers”/ “PKK Political Wings” and so on. The list is long. Turkey has been accusing the HDP with the same allegations. In 2014 the Turks were making jokes about Kurdish people in Syria. Turkey chose to support ISIS and other Islamic extremists, and that’s at the expense of the American taxpayers’ money and NATO’s sophisticated fire power. Turkey has blocked every single effort for Kurdish inclusion in Syria´s peace process and demands again and again to label the PYD as PKK, and thus as a “terrorist” organization. For Turkey a good Kurd is a dead one. Turkey accepts Kurds only when they abandon everything, dehumanize themselves and accept Turkish superiority. Now with Erdogan on power, the Kurds must, in addition, belong to the Moslem Brotherhood too, a la Turkish style. Kurds outside of this framework are labelled by Turkey as PKK, and accordingly “terrorist”. Turkey has also started to label friends of the Kurdish liberation movement as “PKK terrorists” too and has built all its diplomacy on that doctrine. Even the Kurdistan National Congress / KNK, which is the largest non-partisan political and social umbrella organization consisting of many different political parties of all kinds of ideologies, religious organizations, social associations, NGOs and so on. is labeled by Turkey as a “PKK”. Therefore in consequence the PKK, which struggles for secularism, gender equality, freedom of women, liberty for non-Kurd groups, social justice etc., has become an icon of freedom and a freedom loving political party. Every Kurdistani person who starts to understand Turkey sees herself as a PKK. The person simply cannnot escape from the destiny of been a potential “terrorist”. How could she? She has already has committed the sin of being a Kurd who believes in freedom. She has not socially or politically changed to a “PKK”, but rather, at least according to Turkey, she was born as a PKK. Therefore, it really doesn´t matter what the PKK, as a political organization, or a Kurdistani person who fights for her freedom says. There is no a court of law! I am too a PKK, as the PYD, HDP, KNK and all the others, unavoidably are. Nobody should be surprised if people like Mr. D. Trump, Mrs. Angela Merkel or His Majesty King of Norway Harald V. all of a sudden become labelled by Turkey as terrorists if/when they happen to talk about national and democratic rights for people in Kurdistan. This carousel will end only if the USA and EU delist the PKK as a terrorist organization and guide Turkey back to the negotiation table with the PKK. A confederate state for Kurds and Turks will suddenly be fruitful for democracy and the liberty of the area. ← Donald J. Trump on Twitter: This is the single greatest witch hunt of a politician in American history!